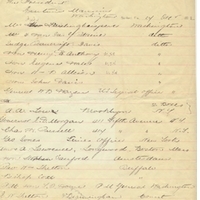 A memorandum listing recipients of oranges sent from Belair Grove in Sanford, Florida, dated December 24, 1882. The list denoted recipients of full boxes and half boxes of oranges. Notable recipients included Republican President Chester A. Arthur (1829-1886); William B. Allison (1829-1908), Republican Senator from Iowa; Senator Henry B. Anthony, Republican Senator from Rhode Island; Eugene Hale (1836-1918), Republican Senator from Maine; abolitionist Amos Adams Lawrence (1814-1886); U.S. Court of Claims Judge Bancroft Davis (1822-1907), who also was the president of the Newburgh and New York Railway Company; and Union General William Tecumseh Sherman (1820-1891). During that period, Henry Shelton Sanford (1823-1891), the owner of Belair Grove, actively courted President Arthur and high-ranking Republicans in the U.S Congress as part of his bid to win recognition in the country, and with it, international legitimacy, for King Leopold II (1835-1909) of Belgium's colonial enterprise in the Congo, what would become known as the Congo Free State. In 1883, acting on behalf of the King Leopold, Sanford mounted a lobbying campaign in Washington, D.C. Preceding these efforts, Sanford regularly corresponded with the President and influential legislators about the Belgian Congo. As part of his lobbying efforts, Sanford regularly sent boxes of Florida oranges to high-ranking officials. This list of recipients reflects the efforts of Sanford to sway public figures in positions of power. Original memorandum by James Edmundson Ingraham, December 24, 1882: box 52, folder 5, subfolder 52.5.1, Henry Shelton Sanford Papers, General Henry S. Sanford Memorial Library, Sanford Museum, Sanford, Florida. Digital reproduction of original memorandum by James Edmundson Ingraham, December 24, 1882. Box 52, folder 5, Henry Shelton Sanford Papers, General Henry S. Sanford Memorial Library, Sanford Museum, Sanford, Florida. Belair Grove Collection, Henry Shelton Sanford Papers Collection, RICHES of Central Florida. Originally created by James Edmundson Ingraham. Donated to the General Henry S. Sanford Memorial Library, Sanford Museum in 1960. Hochschild, Adam. King Leopoldís Ghost. Boston: Houghton Mifflin, 1998. Ingraham, James Edmundson. “List of Recipients of Oranges from Belair Grove (December 24, 1882).” RICHES of Central Florida accessed April 24, 2019, https://richesmi.cah.ucf.edu/omeka/items/show/4387.